This new year, What do we really want? A wife, husband, car, family, a job, money etc. Most often than not, we do get what we want, although sometimes they don't come how we want them or when we want them. But when we do get what we "really" wanted, do we stop yearning for more? No. (Hope I made sense). We are insatiable, always wanting more. You pray for a job, any job to make a living and pay bills, and God answers, next thing you know, you want more. Who doesn't want a better life, right? Many of us, during this past yuletide, had too many drinks, food or whatever it was. Despite the swelling tummy, that piece of chicken still calls out, and you answered the call, you tell yourself you just wanna "taste for salt" in it. True or false. What about the ice chilled bottle that just makes your mouth water. Which you've already said a silent promise that after this drink, no more, but you find yourself drowning in another, forgetting the promise you made. Are we really content with what we have? If history is anything to go by, explorers and conquerers were always on the lookout for a new site to explore, a new world to conquer. When is money ever enough? When is enough ever enough? As this year is birthed, like a baby, its still young (barely two days), let's start now to prepare for the rest of the year. Let's cut our coats to our sizes, let's be content. Let envy, greed, rancour and all other vices go, and embrace love, trust, contentment and watch ourselves grow. Also, waiting upon the Lord to lead us to our greener pastures. Do have a glorious weekend. Happy new year once again. It's sure gonna be a great year, I can feel it. Cheers. Pam, this is nothing but the Truth "We are insatiable, always wanting more. You pray for a job, any job to make a living and pay bills, and God answers, next thing you know, you want more. Who doesn't want a better life, right?" God created us in His image, blessed us to have dominion and multiply but man disobedience has lead him to ways of sorrows, hardship, frustration and stagnation in life. He said in His word: For I have satiated the weary soul, and I have replenished every sorrowful soul. Jeremiah 31:25. Let us consider our ways this new year for the Flood gate of heaven and this is the year of Outpouring. do things that pleases God and with a perfect heart! Pam dear, It's sure gonna be a great year, I know it, for Our Redeemer liveth! Cheers. Exactly. Contentment does it. We are always wanting more. I also believe strongly that the measure of our trust in God is directly proportional to our level of contentment. An individual who is rest assured that God's got his back will not fret about tomorrow or the future. He is able to trust God for greater things while he enjoys what he has access to at the moment . Happy new year to you too dearie. 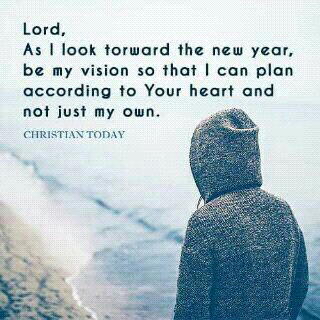 What a great way /tip to start the year. .
May God help us to accomplish what we set ahead for this year.